Jazz had now entered the scene. Today’s Journey into Jazz takes us to New Orleans, Louisiana. The time is the early 1900s. We are traveling by horse-drawn carriage because the automobile has not yet been invented. Our first stop is in a cotton field where we hear a plantation worker singing a work song as he picks cotton (click here to hear the work song). These workers are probably descendants of people who were slaves before the Emancipation Proclamation in 1863 granted them freedom. 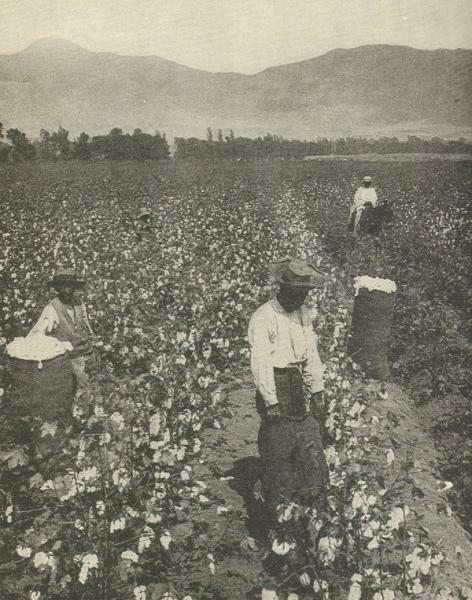 Although by this time free, few employment opportunities other than labor were available to African Americans. Singing as they worked was a way to ease the boredom of this difficult, exhausting, boring work. These songs would eventually become part of jazz. Experience the Music: Make up some words that fit with the work being done here. Next let’s look in on a worship service. When brought to the United States, Africans were forced to abandon their religious practices and adopt Christianity. They brought with them musical traditions from Africa where everyone participated in some way. People danced, drummed, clapped, sang, or moved with the music. Observe how the worshipers are moving with the music. Listen to the call and response patterns in the music and the emotion with which the song is sung (click here to listen). Many of these spirituals were composed during the days of slavery so the lyrics often referred to hopes of escape and freedom. These kinds of melodies, and especially the feelings with which they were sung, would later become part of jazz. As you play the track again (click here), listen to the call and think of how you would sing a "response." Experience the Music: Improvise a response to the recorded call. You can respond in any way you like - sing, tap on your desk with a pencil, or whatever you think of. Are you getting thirsty? Let’s stop in here for a cold drink. We are very lucky today because Scott Joplin is playing the piano (click here to hear him play). Scott Joplin not only performed as an entertainer, he composed may songs called rags or Ragtime for solo piano. These compositions were published as sheet music which people purchased in order to learn to play it on their own piano. The compositions were also "recorded" on piano rolls which people purchased to be played on mechanical player pianos. Before record players, tape players, CD players, and MP3 players, the only mechanically reproduced music was the player piano (click here to listen to another piano rag). We must check out Congo Square, a park in New Orleans where African Americans met on Sundays to socialize. Many of these activities included music like the cake walk, which was a dance contest. The couple judged to dance the best was awarded a cake for their prize. Often the music for the cake walk was an instrumental band version of Ragtime (click here to listen). Why don’t we take our time machine now and visit Congo Square as it is today? It is now called the New Orleans Jazz National History Park, and is often used for jazz concerts. There are statues of famous jazz trumpeter Louis Armstrong and clarinetist/saxophonist Sidney Bechet. As we return to Basin Street, a parade is passing by. This particular parade is for a funeral which has just left the cemetery after burying a dear friend. Listen to the mournful sound of the music being played by the band (click here to listen). But wait! What is happening now? The music has changed and is peppier and happier (click here). They will now celebrate the life of the departed friend by dancing to this music. Let’s follow them and see where they go. It looks like a hall where friends meet to socialize (click here to listen to the music in the hall). The musicians playing are some of the very best early jazz players from New Orleans. Louis Armstrong is playing cornet and Sidney Bechet is playing soprano saxophone. The music they are playing is often called New Orleans style jazz or Dixieland. Collective improvisation, when two or more players improvise at the same time, is an important part of this style of music. Let’s catch the train which will take us to our next destination: Chicago, Illinois. All Aboard! Prior to the Emancipation Proclamation, many people of color lived in harmony in New Orleans. Creole musicians were educated and trained as classical musicians. They lived as equals with white citizens of New Orleans. After the slaves were freed, Jim Crow laws were passed which required the separation of the races in public places. The “one drop of black blood” test caused all Creoles to be treated the same as the former slaves. Creole musicians who had formerly performed classical music now found their only performance opportunities were with the self-taught freed slaves. The result was a blending of elements of European classical music with the spontaneous self-expression of the black musicians which was important in the development of jazz. By the early 1900s music we now identify as jazz was beginning to be performed in New Orleans. For further background information, visit the Jazz Resource Library on this web site, and read about African Music, Pre-Jazz Bands, and Early Jazz (Dixieland). cake walk: A dance contest in Congo Square. The couple judged to have danced the best won a cake as a prize. The cakewalk was danced to ragtime music. call and response: Musical conversation. One musician or section will play a short melodic idea and is answered by another musician or section. collective improvisation: Two or more musicians improvising at the same time. Congo Square: The area in New Orleans where musicians met for social activities and to play music. Creole: Louisiana residents with African heritage mixed with Spanish or French ancestry. improvisation: Creating a new melody while performing. Spontaneous composition. Dixieland: Early instrumental jazz band music. The name given to New Orleans style jazz when it began to be played in Northern cities. This style of jazz is also known as New Orleans style jazz, Chicago style jazz or traditional jazz. Emancipation Proclamation: Declaration by President Abraham Lincoln on January 1, 1863 that freed all persons previously held as slaves. jazz: Music originating in America. Characteristics include syncopation, improvisation and strong expressions of emotion. player piano: A piano with mechanism which causes the keys to play. Player pianos operate by the use of a perforated paper roll and a pneumatic system. Ragtime: Piano style with stride left hand and highly syncopated right hand. Ragtime was composed music. saxophone: Musical instrument in the woodwind family. The sound is produced by blowing into a reed mouthpiece. spirituals: Music with a religious theme. syncopation: Placement of accents in unexpected places. Placement of notes between the steady beats. work song: A song sung in same rhythm as a task being done. Groups would sometimes sing together to keep the workers moving at a steady pace.